The function of striatal adenosine A2A receptors (A2ARs) is well recognized because of their high expression levels and the documented antagonistic interaction between A2ARs and dopamine D2 receptors in the striatum. However, the role of extrastriatal A2ARs in modulating psychomotor activity is largely unexplored because of the low level of expression and lack of tools to distinguish A2ARs in intrinsic striatal versus nonstriatal neurons. Here, we provided direct evidence for the critical role of A2ARs in extrastriatal neurons in modulating psychomotor behavior using newly developed striatum-specific A2AR knock-out (st-A2AR KO) mice in comparison with forebrain-specific A2AR KO (fb-A2AR KO) mice. In contrast to fb-A2AR KO (deleting A2ARs in the neurons of striatum as well as cerebral cortex and hippocampus), st-A2AR KO mice exhibited Cre-mediated selective deletion of the A2AR gene, mRNA, and proteins in the neurons (but not astrocytes and microglial cells) of the striatum only. Strikingly, cocaine- and phencyclidine-induced psychomotor activities were enhanced in st-A2AR KO but attenuated in fb-A2AR KO mice. Furthermore, selective inactivation of the A2ARs in extrastriatal cells by administering the A2AR antagonist KW6002 into st-A2AR KO mice attenuated cocaine effects, whereas KW6002 administration into wild-type mice enhanced cocaine effects. These results identify a critical role of A2ARs in extrastriatal neurons in providing a prominent excitatory effect on psychomotor activity. These results indicate that A2ARs in striatal and extrastriatal neurons exert an opposing modulation of psychostimulant effects and provide the first direct demonstration of a predominant facilitatory role of extrastriatal A2ARs. Adenosine A2A receptors (A2ARs) are highly expressed in the striatum with significantly lower expression in other forebrain regions, including cerebral cortex and hippocampus (Svenningsson et al., 1999). In the striatum, A2ARs are colocalized with dopamine D2 receptors (D2Rs) in striatopallidal neurons (Svenningsson et al., 1999). Antagonistic A2AR–D2R interaction in the striatum has been demonstrated at the molecular (immediate early gene expression), neurochemical (GABA and acetylcholine release), and behavioral (locomotor activity) levels (Ferre et al., 1997). This functional antagonism is the basis for the development of A2AR antagonists as a promising nondopaminergic pharmacological therapy for Parkinson's disease (Schwarzschild et al., 2006), whereas A2AR agonists have been proposed as potential therapeutic agents for schizophrenia (Ferre, 1997) and other psychotic disorders (Fredholm et al., 2005). However, contrary to the antagonistic A2AR–D2R interaction model in the striatum and certain pharmacological data (Filip et al., 2006), genetic inactivation of A2ARs either globally or specifically in forebrain region attenuates, rather than enhances, the psychostimulant effects of cocaine (Chen et al., 2000), amphetamine (Chen et al., 2003; Bastia et al., 2005), or l-dopa (Fredduzzi et al., 2002; Xiao et al., 2006). These observations suggest that the activation of A2ARs in extrastriatal cells may oppose postsynaptic A2AR function in striatopallidal neurons on the modulation of psychomotor activity. We hypothesized that in addition to the postsynaptic striatal A2AR–D2R antagonistic interaction, A2ARs in extrastriatal neurons also contribute to the modulation of psychostimulant actions. For example, A2ARs in cerebral cortex may affect glutamatergic inputs to the striatum (for review, see Schiffmann et al., 2007) to influence excitatory driving force for striatal circuits (Gerfen, 1992) that are crucial for psychomotor behavior and the development of psychostimulant action (Wolf, 1998). However, the modulatory role of A2ARs in extrastriatal neurons on psychomotor activity has largely been unexplored because of the low expression level of A2ARs in extrastriatal neurons and the inability of pharmacological tools to distinguish A2ARs in the intrinsic striatal neurons from A2ARs in extrastriatal neurons. To overcome these difficulties, we have developed striatum-specific A2AR knock-out (st-A2AR KO; selective deletion of A2AR in intrinsic striatal neurons) mice and forebrain-specific A2AR knock-out (fb-A2AR KO; selective deletion of A2ARs in neurons of the striatum, as well as cerebral cortex and hippocampus) mice (Bastia et al., 2005). Using these novel brain region-specific A2AR KO models, we demonstrate that A2ARs in intrinsic striatal neurons and extrastriatal neurons exert opposing effects on cocaine- or phencyclidine (PCP)-induced psychomotor activity. These results define a novel opposing function of A2ARs in striatal and extrastriatal neurons to fine-tune psychomotor activity. Generation and genotyping of striatum A2AR KO mice and forebrain A2AR KO mice. Animals were handled according to the National Institutes of Health Guide for the Care and Use of Laboratory Animals and in accordance with the protocol approved by the Institutional Animal Care and Use Committee at the Boston University School of Medicine. The Cre-loxP strategy was used to generate fb-A2AR KO and st-A2AR KO mice. The generation and genotyping of fb-A2AR KO mice has been described recently (Bastia et al., 2005). 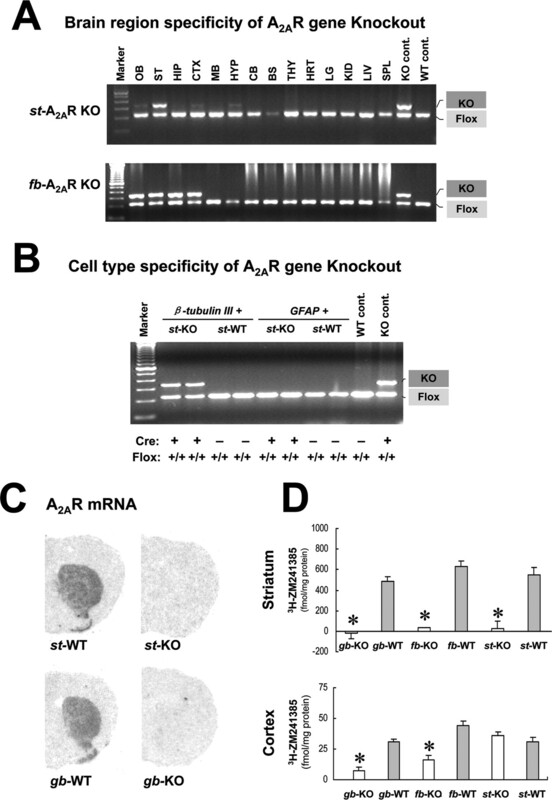 Similar methods were used to generate st-A2AR KO mice (N. Ohtsuka and J. Z. Tsien, unpublished work). Briefly, homozygous floxed (A2ARflox/flox) mice (F5 generation in mixed 129-Steel and C57BL/6 background) were cross-bred with Dlx5/6-Cre transgenic mice expressing Cre recombinase under control of Dlx5/6 promoter, which is active exclusively in striatal neurons during development (Zerucha et al., 2000), to generate st-A2AR KO [Dlx5/6-Cre(+)A2ARflox/−] mice. Genotyping was conducted by three-primer PCR analysis of tail DNA (Bastia et al., 2005). Our pilot studies showed that the expression of transgene Cre [Cre(+)A2AR−/−] or flox [Cre(−)A2ARflox/flox] did not affect psychomotor responses (data not shown), and thus the two wild-type (WT) mice were pooled into one group referred to as simply st-WT or fb-WT. Drug treatments and psychomotor activity assessments. Animals were maintained in temperature- and humidity-controlled rooms with a 12 h light/dark cycle. Before drug treatment, all mice were habituated in the testing environment, and mice were injected with a single dose of cocaine (25 mg/kg, i.p. ), KW6002 (3.3 mg/kg, i.p. ; dissolved in vehicle: 15% DMSO, 15% castor oil, and 70% H2O), or PCP (5 mg/kg and 10 mg/kg, i.p., on consecutive days). In the combined treatment, KW6002 was injected 10 min before cocaine treatment. Horizontal locomotor activity (ambulation, horizontal consecutive adjacent beam breaks), fine movement (horizontal single beam break), and rearing (vertical beam break) were monitored for 120–180 min after drug administration and analyzed as described previously (Chen et al., 2000, 2003). In situ hybridization histochemistry was performed on postfixed fresh mouse brain slices as described previously using an A2AR oligonucleotide probe complementary to positions 51–95 bp of the A2AR cDNA sequences (accession number NM_009630) (Benn et al., 2004). Total membranes from the frontal cerebral cortex and striatum were prepared as described (Rebola et al., 2005), incubated with adenosine deaminase (2 U/ml; Sigma, St. Louis, MO) for 30 min at 37°C and centrifuged. Pellets were resuspended and incubated with 3 nm 3H-ZM241385 (specific activity of 77 Ci/mmol; GE Healthcare, Piscataway, NJ) for 1 h at 37°C. Specific binding was determined by subtracting the nonspecific binding, measured in the presence of 1 μm XAC, a mixed A1/A2 receptor antagonist. Striatum from each hemisphere was processed for binding assay. Each binding assay was performed in duplicate. Data of both hemispheres were averaged to present as the value for each mouse. To distinguish between A2AR-mediated postsynaptic and presynaptic functions in the striatum, we developed st-A2AR KO mice using the loxP-Cre strategy as described in the methods section. The deletion of the first coding exon of the murine A2AR gene was verified by PCR, using primers specific for the loxP site near the A2AR gene as described previously (Bastia et al., 2005). In the st-A2AR KO line, the Cre-mediated A2AR gene deletion (i.e., “KO band”) was detected strongly in the striatum (ST) and weakly in the olfactory bulb (OB) of st-A2AR KO [Dlx5/6-Cre(+)A2ARflox+/+] mice but was absent in st-WT [Dlx5/6-Cre(−)A2ARflox+/+] mice, whereas the “flox” bands were detected in all animals regardless of Cre genotypes (Fig. 1A, top). No “KO” band was seen in other forebrain regions [hippocampus (HIP), cortex (CTX), and hypothalamus (HYP)] and other brain regions [midbrain (MB), cerebellum (CB), and brainstem (BS)]. The generation and initial characterization of fb-A2AR KO [CaMKIIα-Cre(+)A2ARflox+/+] mice has been described previously (Bastia et al., 2005). In contrast to st-A2AR KO (with the “KO” band detected only in striatum), fb-A2AR KO mice displayed Cre-mediated deletion of the A2AR gene in the striatum as well as olfactory bulb, hippocampus, and cerebral cortex, but not in the cerebellum and brainstem (Fig. 1A, bottom). Cre-mediated A2AR gene deletion was not detected in the six peripheral organs tested of either st-A2AR KO or fb-A2AR KO mice (Fig. 1A, both panels). Therefore we have selectively deleted the A2AR gene in the striatum of st-A2AR KO mice and in the forebrain (including the striatum, cerebral cortex, and hippocampus) of fb-A2AR KO mice. Characterization of striatum A2AR KO mice with selective deletion of A2AR gene and proteins in striatal neurons. A, Brain region specificity of Cre-mediated A2AR gene deletion in st-A2AR KO and fb-A2AR KO mice. Floxed alleles of the A2AR gene (“Flox” band) or Cre-mediated deletion of the A2AR gene (“KO” band) were detected by PCR analysis using a three-primer set as described previously (Bastia et al., 2005). Genomic DNAs were isolated from OB, ST, HIP, CTX, MB, HYP, CB, BS, thymus (THY), heart (HRT), lung (LG), kidney (KID), liver (LIV), and spleen (SPL). KO cont. and WT cont. are PCR products of genomic DNA isolated from the tail of fb-KO and fb-WT mice, respectively. B, Cell-type specificity of Cre-mediated A2AR gene deletion in st-A2AR KO mice by flow cytometric sorting and PCR analyses. Striatal neurons (β-tubulin III+ cells) and astrocytes (GFAP+ cells) of st-A2AR KO (i.e., Cre+) and their WT littermates (i.e., Cre−) were separated by flow cytometric sorting, followed by PCR analysis of genomic DNAs in the sorted cells. C, In situ hybridization of A2AR mRNA in the st-A2AR KO and gb-A2AR KO mice and their corresponding WT littermates. D, Quantitative analysis of 3H-ZM241385 binding in total membrane preparations of the striatum and cerebral cortex from mice of each of the six different genotypes. The data were presented as mean ± SEM (fmol/mg protein; n = 3–4 per group). *p < 0.05 (1-way ANOVA, post hoc Bonferroni test), comparing gb-A2AR KO, fb-A2AR KO, and st-A2AR KO groups to their corresponding WT group. To demonstrate the cell type specificity of A2AR gene deletion in st-A2AR KO mice, we performed flow cytometry cell sorting to separate neurons (β-tubulin III-positive cells) and astrocytes (GFAP-positive cells). In neuronal and astroglial sorted cells from st-WT mice, no deletion of the A2AR gene (“KO” band) was present; this band was detected in sorted neurons (β-tubulin III-positive cells) in st-A2AR-KO mice, but was absent from sorted astroglial cells (GFAP-positive cells) from the same mice (Fig. 1B). A residual “flox” band remained in the sorted neuronal cells in st-A2AR KO mice, indicating either contamination with non-neuronal cells or the presence of striatal neurons that do not express CaMKIIα-Cre (e.g., striatal cholinergic interneurons). Nevertheless, these results clearly demonstrate the neuronal specificity of gene deletion in st-A2AR KO mice. In situ hybridization confirmed that intense labeling of A2AR mRNA was restricted to the striatum of st-WT mice; this staining was abolished in st-A2AR KO mice (Fig. 1C). Notably, the deletion of A2AR mRNA in the striatum of st-A2AR KO mice was comparable with that seen in global A2AR KO (gb-A2AR KO) mice (Fig. 1C). To demonstrate that only striatal A2ARs are lost in st-A2AR KO mice, whereas intrinsic striatal as well as extrastriatal (such as cerebral cortex) A2ARs are deleted in fb-A2AR KO mice, we quantified the density of A2ARs in total membranes from the striatum and cerebral cortex of st-A2AR KO, fb-A2AR KO, and gb-A2AR KO mice by binding assays. Figure 1D shows high binding density of 3H-ZM241385 (A2AR antagonist) in striatal membranes of three types of WT mice (n = 3/group). In contrast, 3H-ZM241385 binding was almost completely abolished in the striatum of all three A2AR KO lines (n = 4) (Fig. 1D, top). As expected, 3H-ZM241385 binding was unaffected in cortical membranes in st-A2AR KO mice, whereas this binding was abolished in cortical membranes of fb-A2AR KO mice and gb-A2AR KO mice (Fig. 1D, bottom). These data demonstrate the successful creation of brain region (striatum)-specific and cell type (neuron)-specific A2AR KO mice with preservation of extrastriatal A2ARs in st-A2AR KO mice. Having demonstrated the selective deletion of intrinsic striatal A2ARs and preservation of extrastriatal A2ARs in st-A2AR KO mice, we examined the motor-stimulant effect of the A2AR antagonist KW6002 in fb-A2AR KO (Fig. 2A) and st-A2AR KO (Fig. 2B) mice and found that KW6002 (3.3 mg/kg, single i.p.) produced no motor-stimulant effect in either type of A2AR KO mice compared with their respective WT littermates. Cocaine- or PCP-induced psychomotor activity is attenuated in forebrain A2AR KO mice but enhanced in striatum A2AR KO mice. Ambulation was recorded in KO and WT mice for 120–180 min after injection of cocaine (25 mg/kg, i.p. ), KW6002 (3.3 mg/kg, i.p. ), PCP (10 mg/kg, i.p. ), or vehicle. The arrows indicate time of injection. A, KW6002-induced motor activity in fb-A2AR KO (n = 8) and fb-WT (n = 8) mice. B, KW6002-induced motor activity in st-A2AR KO (n = 9) and st-WT (n = 15) mice. C, Cocaine-induced psychomotor activity in fb-A2AR KO (n = 11) and fb-WT (n = 12) mice. D, Cocaine-induced psychomotor activity in st-A2AR KO (n = 13) and st-WT (n = 13) mice. E, PCP-induced psychomotor activity in fb-A2AR KO (n = 8) and fb-WT (n = 8) mice. F, PCP-induced psychomotor activity in st-A2AR KO (n = 8) and st-WT (n = 8) mice. #p < 0.05 (1-way ANOVA, post hoc Bonferroni test), comparing fb-A2AR KO and st-A2AR KO groups to their corresponding WT group. Next, we assessed the contribution of extrastriatal versus striatal A2ARs to cocaine- and PCP-induced psychomotor activity in st-A2AR KO and fb-A2AR KO mice. Cocaine (25 mg/kg, i.p.) produced significant psychomotor effect in both st-WT and fb-WT mice (Fig. 2C,D). In fb-A2AR KO mice, cocaine-induced psychomotor activity was attenuated (Fig. 2C), a result similar to what had previously been described in gb-A2AR KO mice. However, specific deletion of intrinsic striatal A2AR in st-A2AR KO mice enhanced, rather than attenuated, cocaine-induced psychomotor activity (Fig. 2D), a result similar to what had been noticed in pharmacological A2AR antagonist studies (Filip et al., 2006). Similar to cocaine, PCP (10 mg/kg, single i.p.) also produced enhanced psychomotor activity in st-A2AR KO mice (Fig. 2F), but attenuated psychomotor effect in fb-A2AR mice (Fig. 2E) when compared with their corresponding WT littermates. Furthermore, the decreased locomotor activity observed in fb-A2AR KO after cocaine and PCP treatment was specific and not attributable to the presence of competing stereotyped behavior, because the cocaine-induced fine movements and rearing are similarly reduced, whereas PCP-induced fine movement and rearing were not affected in st-A2AR KO and fb-A2AR KO compared with their WT littermates (data not shown). Thus, selective inactivation of intrinsic striatal A2ARs (st-A2AR KO) or extrastriatal A2ARs (fb-A2AR KO) produces opposing effects on cocaine- and PCP-induced psychomotor activity, which provide the first direct demonstration that extrastriatal A2ARs play an important facilitating role in the modulation of cocaine-induced psychomotor effects. To further investigate how the selective inactivation of extrastriatal A2ARs affects cocaine-induced psychomotor stimulation, we tested the ability of KW6002 (3.3 mg/kg, i.p.) to modify the cocaine (25 mg/kg, i.p. )-induced psychomotor behavior in the two A2AR KO mouse lines and their WT littermates. As expected, in WT mice (st-WT and fb-WT), KW6002 significantly enhanced the psychomotor effects of cocaine (Fig. 3A,C). 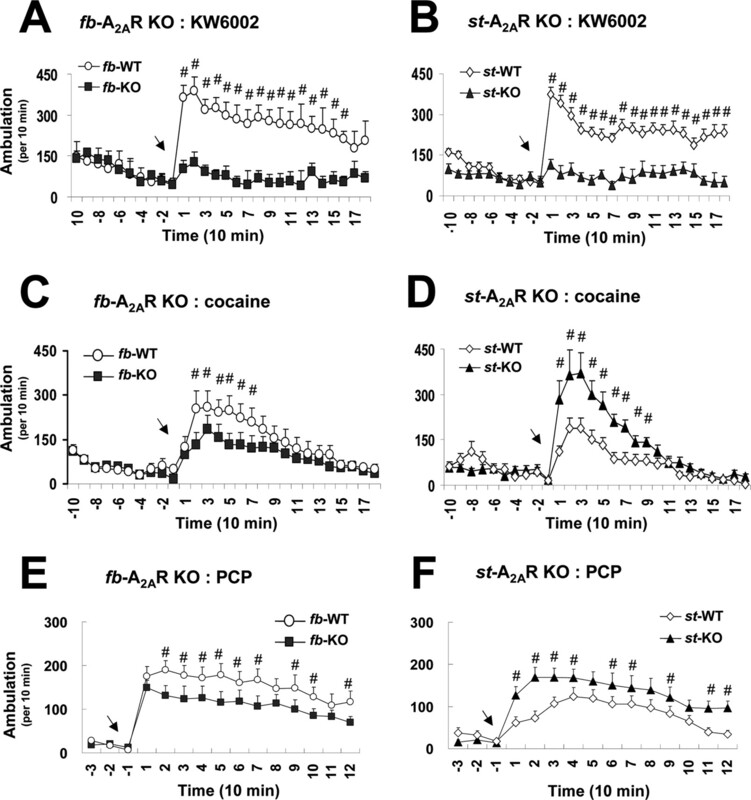 Administering KW6002 to st-A2AR KO mice, which blocked extrastriatal A2ARs (resulting from the deletion of intrinsic striatal A2AR target), attenuated cocaine-induced psychomotor activity (Fig. 3B), suggesting that the extrastriatal A2ARs facilitate cocaine-induced psychomotor effects. The targets of KW6002 are likely the presynaptic A2ARs located in extrastriatal forebrain neurons, because combined treatment with KW6002 and cocaine in fb-A2AR KO mice produced similar effects compared with cocaine treatment alone (Fig. 3D). This observation confirms that the attenuation of cocaine-induced psychomotor activity by KW6002 in st-A2AR KO mice is the result of selective blockade of extrastriatal A2ARs on striatal forebrain afferents, which likely represents the A2ARs expressed on corticostriatal afferents (Schiffmann et al., 2007). KW6002 effect on cocaine-induced psychomotor activity in forebrain A2AR KO and striatum A2AR KO mice. A–D, The fb-A2AR KO and st-A2AR KO mice and their corresponding WT littermates were treated with KW6002 (3.3 mg/kg, i.p.) or vehicle 10 min before cocaine (25 mg/kg, i.p.) administration. Ambulation was recorded for 120 min after cocaine injection. 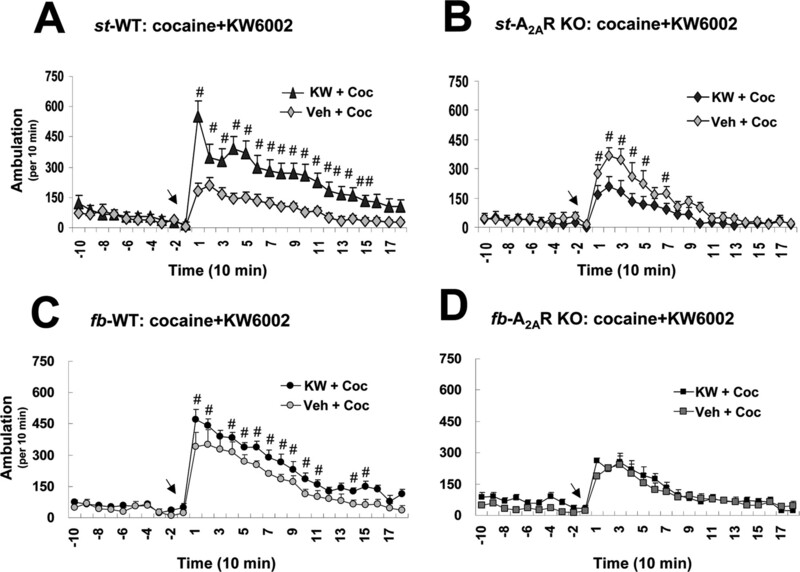 KW6002 increases cocaine-induced ambulation in st-WT mice (n = 12; A) and fb-WT mice (n = 8; C). KW6002 attenuates cocaine-induced ambulation in st-A2AR KO mice (n = 8; C) and shows no additional effect on cocaine-induced ambulation in fb-A2AR KO mice (n = 8; D). #p < 0.05, comparing cocaine plus KW6002 to cocaine plus vehicle. The st-A2AR KO mice and fb-A2AR KO mice developed here provide novel tools to investigate the effects of extrastriatal A2ARs and intrinsic striatal A2ARs on psychomotor activity. The st-A2AR KO mice exhibit regional (i.e., striatum specific, and not other forebrain regions) (Fig. 1A) and cellular (i.e., striatal neurons alone, not glia) (Fig. 1B) specificity, with complete deletion of the A2AR gene comparable to fb-A2AR KO or gb-A2AR KO mice at both mRNA and protein levels. Comparative analysis revealed strikingly opposite behavioral phenotypes of st-A2AR KO and fb-A2AR KO mice: consistent with our previous findings with fb-A2AR KO (Bastia et al., 2005; Xiao et al., 2006) and gb-A2AR KO mice (Chen et al., 2000, 2003), cocaine-induced psychomotor activity is attenuated in fb-A2AR KO mice. Importantly, selective inactivation of intrinsic striatal A2ARs (st-A2AR KO mice) enhanced cocaine-induced psychomotor activity. This is attributed to the A2AR–D2R antagonistic interaction at striatopallidal neurons (Ferre et al., 1997). The opposite phenotypes in st-A2AR KO mice (i.e., enhancement) and fb-A2AR KO mice (i.e., attenuation) after cocaine treatment provide the first direct evidence for the critical role of A2ARs in extrastriatal neurons in modulating psychomotor activity. Furthermore, the differential effects of the combined treatment with KW6002 and cocaine on psychomotor activity, administered to st-WT or fb-WT (enhancement), st-A2AR KO mice (attenuation), and fb-A2AR KO (same as cocaine treatment alone) provide pharmacological evidence to substantiate the opposing regulation on cocaine's psychomotor effect in st-A2AR KO and fb-A2AR KO mice. Thus, consistent with the previously reported effect of the combined treatment of cocaine and A2AR antagonists (Filip et al., 2006), administering A2AR antagonists to WT mice produced predominantly striatopallidal A2AR responses, likely because of high expression level of A2ARs in the striatum. In contrast, administering A2AR antagonists to st-A2AR KO mice produced selective blockade of A2ARs in extrastriatal neurons (because there was no intrinsic striatal A2AR target), therefore attenuating cocaine-induced psychomotor activity. The opposing effects of KW6002 when administered to WT (enhancement) or st-A2AR KO (attenuation) mice provide compelling evidence for the critical role of A2ARs in extrastriatal neurons in the modulation of cocaine-induced psychomotor activity. These results identify a critical role of extrastriatal A2ARs to provide a prominent excitatory effect to counter the documented inhibitory effect of striatal A2ARs on cocaine-induced psychomotor activity. The high level of A2ARs in the striatum (Svenningsson et al., 1999) and well documented A2AR–D2R antagonistic interaction have led to the proposal of A2AR agonists as potential antipsychotic agents (Ferre, 1997). As demonstrated here, A2AR modulation of psychomotor activity involves multiple actions of A2ARs in striatal neurons as well as in extrastriatal neurons. In fact, extrastriatal A2ARs are such powerful sites for modulating psychomotor activity that activation of extrastriatal A2ARs predominates over striatal A2AR actions. The evidence that A2ARs in extrastriatal neurons facilitate psychomotor activity clearly implies a shift in paradigm such that the predominant control of psychostimulant action may be preferentially achieved through the A2ARs in extrastriatal neurons rather than through the striatal medium spiny neurons. Furthermore, previous studies have demonstrated attenuated psychostimulant actions (Chen et al., 2000, 2003; Bastia et al., 2005), increased anxiety (Ledent et al., 1997), attenuated depressive behaviors (El Yacoubi et al., 2001), attenuated prepulse inhibition (Wang et al., 2003), and increased aggressive behavior (Ledent et al., 1997) in global A2AR KO mice or WT mice treated with A2AR antagonists. These cognitive behavioral changes in global A2AR KO mice cannot be fully accounted for by the antagonistic A2AR–D2R interaction in striatal neurons. Our findings suggest that it might be possible to modulate neurotransmitters by altering A2AR activity in extrastriatal (such as cortical) neurons, and therefore influence a variety of neuropsychiatric behaviors such as psychostimulant addiction, anxiety, depression, and psychosis. Thus, A2ARs localized to extrastriatal neurons may represent an important molecular target for modulating psychomotor behaviors. The most intriguing aspect of the function of A2ARs in extrastriatal neurons is their ability to oppose and override the psychomotor modulatory effect of A2ARs in striatopallidal neurons, which has a nearly 20-fold higher density. Based on the postulated role of presynaptic A2ARs in facilitating glutamate release in the modulation of striatal plasticity (Schiffmann et al., 2007) and the electrophysiological studies suggesting selective enhancement of adenosine tone at glutamatergic terminals after cocaine treatment (Fiorillo and Williams, 2000), we speculate that A2ARs in glutamatergic terminals from cortex and thalamus may contribute to this effect. The involvement of the glutamatergic system in A2A R modifications of psychomotor activity is supported by the finding that PCP-induced psychomotor activity is similarly modulated in st-A2AR KO versus fb-A2AR KO mice. Further investigation into the interaction of the A2A R with the glutamatergic system as well as other neurotransmissions may uncover the mechanism underlying the critical modulation of psychomotor activity by A2A Rs in striatal as well as extrastriatal neurons. This work was supported by National Institutes of Health Grants NS048995 and NS41083, Department of Defense Grant W81XWH-07-1-0012, the Bumpus Foundation (J.-F.C. ), and by Fundação para a Ciência e Tecnologia Grant POCI-BIA-BCM-59980-2004 (R.A.C.). We thank Dr. Alexia Pollack for discussions, comments, and proofreading of this manuscript. (2005) A crucial role for forebrain adenosine A(2A) receptors in amphetamine sensitization. Neuropsychopharmacology 30:891–900. (2004) Neurotransmitter receptor analysis in transgenic mouse models. Methods Mol Biol 277:231–260. (2000) Selective attenuation of psychostimulant-induced behavioral responses in mice lacking A(2A) adenosine receptors. Neuroscience 97:195–204. (2003) Inactivation of adenosine A2A receptors selectively attenuates amphetamine-induced behavioral sensitization. Neuropsychopharmacology 28:1086–1095. (2001) Adenosine A2A receptor antagonists are potential antidepressants: evidence based on pharmacology and A2A receptor knockout mice. Br J Pharmacol 134:68–77. (1997) Adenosine-dopamine interactions in the ventral striatum. Implications for the treatment of schizophrenia. Psychopharmacology (Berl) 133:107–120. (1997) Adenosine-dopamine receptor-receptor interactions as an integrative mechanism in the basal ganglia. Trends Neurosci 20:482–487. (2006) Involvement of adenosine A2A and dopamine receptors in the locomotor and sensitizing effects of cocaine. Brain Res 1077:67–80. (2000) Selective inhibition by adenosine of mGluR IPSPs in dopamine neurons after cocaine treatment. J Neurophysiol 83:1307–1314. (2002) Persistent behavioral sensitization to chronic l-DOPA requires A2A adenosine receptors. J Neurosci 22:1054–1062. (2005) Actions of adenosine at its receptors in the CNS: insights from knockouts and drugs. Annu Rev Pharmacol Toxicol 45:385–412. (1997) Aggressiveness, hypoalgesia and high blood pressure in mice lacking the adenosine A2a receptor. Nature 388:674–678. (2005) Different synaptic and subsynaptic localization of adenosine A2A receptors in the hippocampus and striatum of the rat. Neuroscience 132:893–903. (2007) Adenosine A(2A) receptors and basal ganglia physiology. Prog Neurobiol 83:277–292. (2006) Targeting adenosine A2A receptors in Parkinson's disease. Trends Neurosci 29:647–654. (1999) Distribution, biochemistry and function of striatal adenosine A2A receptors. Prog Neurobiol 59:355–396. (2003) Reduced startle habituation and prepulse inhibition in mice lacking the adenosine A2A receptor. Behav Brain Res 143:201–207. (2006) Forebrain adenosine A2A receptors contribute to l-3,4-dihydroxyphenylalanine-induced dyskinesia in hemiparkinsonian mice. J Neurosci 26:13548–13555. (2000) A highly conserved enhancer in the Dlx5/Dlx6 intergenic region is the site of cross-regulatory interactions between Dlx genes in the embryonic forebrain. J Neurosci 20:709–721.